While touring around the Churchill Management Wildlife Area in Churchill, Manitoba, we were lucky to capture a picture of this Arctic Fox showing off his winter coat. When winter begins to rear its head around the Hudson Bay in Churchill, Manitoba it is very possible to see an Arctic Fox foraging around the shoreline. With its coat a beautiful white color like the snow, the Arctic Fox is prepared for its winter camouflage to protect itself from any predators. 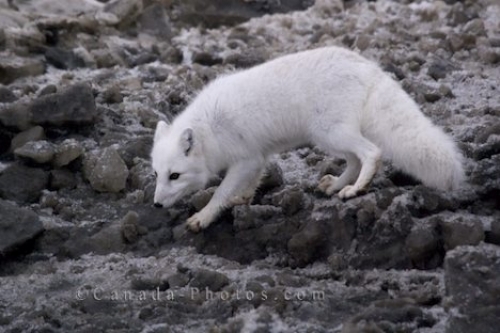 This Arctic Fox is so busy capturing his next meal, he does not pay much attention to us as we take his picture. Picture of an Arctic Fox along the shores of the Hudson Bay in Churchill, Manitoba as winter begins to take over the area.